Drinking fountains are collective water supply points or standpipes for people who do not have a private connection. They may be connected to the main city network or to a small independent network supplied from a well or another source of supply..
2) Who uses this means ? Overall, drinking fountains are the most widespread source of water supplies for populations who do not have a private connection, but this significance varies from one city or country to another. Very often used in Ouagadougou (Burkina Faso) or in Niger, for example, drinking fountains hardly exist in Conakry (Guinea) or in Dar es Salam (Tanzania). 3) Who is ​primarily concerned ? Most water distribution bodies or utilities have chosen to provide a minimum level of service through drinking fountains in neighbourhoods where the prospects for generalizing private connections remain low, even if this kind of supply remains the ultimate goal of such bodies. Drinking fountains are appreciated by the least favoured users as this brings them water available nearby, that they can purchase in small quantities, depending on the funds available to them. They further represent a means of supply that is especially well suited to dry areas as they limit any water wastage. 4) How is this​ done ? Drinking fountains are collective water distribution points where water is sold in bulk. Generally they comprise a base to support the standpipes, a water meter and a drainage mechanism to stop water from building up on the ground. A barrier may be fitted to keep animals away. The supporting base may be made from wood, stone or concrete and must be sized to resist deterioration as drinking fountains are not always well cared for.It is important that the drinking fountain be functional. Consequently, allowance must be made for ergonomic factors. It is necessary, for example, to think about the height of the taps and the distance between the water outlet and the base. If this distance is too small or if the taps are too low or too high, then it may be awkward to fill water containers. It is also important to ensure that water can run off. Not all of the water falls into containers. Hence a mechanism for draining off and removing water is essential to avoid pools of water forming and to keep the place clean. The taps used are the most sensitive part of the facility as they may need to stand up to 150 opening and closing cycles every day. Consequently, we note that a tap generally lasts only three to four months. If a worn out tap is not repaired or replaced, then any leaks will cause wasted water. A broken tap can considerably affect the service provided by the drinking fountain. The most used taps are (conventional) screw taps and quarter turn taps. The latter kind offer the advantage of quickly reaching their maximum flow rate so that they can be opened and immediately shut off. Unfortunately, a quarter turn tap cannot be disassembled so it cannot be repaired. To fill buckets and basins with 10 to 20 litres of water in a reasonable amount of time, approximately 30 seconds, the drinking fountain must be sized so that it provides a water flow of 40 litres per minute from each tap. The water supply to the drinking fountain and the taps used must be suited to such flow rates. Even if drinking fountains are very often found in Africa, many of them only work for very limited periods, sometimes only a few hours, and often at night. This is due most often to supply interruptions or reduced mains water pressure. To address this issue, building a storage tank may be envisaged so as to secure the water supply. As water from drinking fountains is not generally free, it is necessary to determine the amount of water leaving the taps. Drinking fountains must therefore have a water metering system. As water meters are costly accessories that cause a slight loss of pressure, the meters used must be chosen to match a certain rated flow rate. For flow rates that differ from this rated flow rate, they may turn out to be inaccurate. A drinking fountain may be a public facility paid for by the state or by a city or town, who generally entrust its management to a water entity, or it may be a private investment made by small time entrepreneurs, and it may or may not be connected to the public water main. A new system, one that is sometimes badly accepted, is currently being rolled out in some African countries like South Africa or Morocco is the prepaid drinking fountain. Users have a card that they use to buy water from automatic drinking fountains. Some towns and cities credit the cards with a set minimum value every week or every month so that any water consumption in excess of this value is paid for by the users themselves who need to reload their cards at accredited stores. - Cost of installation (per family served) which remains lower than that of a private connection. 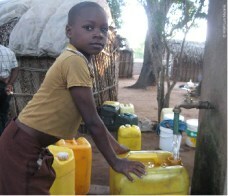 - Better available water sharing between families. - Easier and quicker to set up and roll out than a network of private connections. - The need to go back and forth to the drinking fountains and the fairly frequent long queues that cause bothersome and unproductive time wasting. - There is a risk that the water will become polluted between the time when it leaves the tap and when it is used (during transportation and storage). - Often water is only available from drinking fountains during limited periods, sometimes at night. - There is a need for maintenance to ensure continued good operating condition, as it for public and intensive use, subject to deterioration. - Water prices from a drinking fountain are sometimes 3 to 5 times higher than the cost of water from a private connection. Queues of cart drivers and water carriers are often seen at drinking fountains. These operators are most often essential to bring water to families that live further away and they must be considered as useful auxiliaries that should however be monitored to avoid prohibitive charges being made and to help them become better organised and coordinated town or city-wide. Any project to install a drinking fountain should be undertaken with the participation of the local population, especially as regards where the equipment is located and ergonomic aspects along with the choice of who is to run the drinking fountain. The drinking fountain must be located somewhere clean and well kept where it can provide a quality service. Furthermore, as the drinking fountain is a local meeting place, this should be taken into account when designing its equipment. An interesting and less costly alternative to drinking fountains is that of Collective Distribution Points. These are points where water is available from a set of some 16 taps installed in a public place instead of a drinking fountain. Each tap has an individual water meter fitted ahead of it and comes with a secure tap so that it can be assigned to a household or a group of persons who will then be billed for water as if they were individual household users. They gain access to water at all hours, unlike most drinking fountains that call for someone to run them, who has working hours. In Ouagadougou, water supplies are a major challenge due to the scarcity of water resources and the inability to offer a private connection to all of the families that live in outlying urban areas as the extension of the mains water network cannot keep up with growing urbanisation. To promote diversification in water distribution systems and improve the sharing of resources when faced with a context of drought, the authorities have preferred the installation of drinking fountains, which have multiplied since 1984-1985. In 1999, drinking fountains provided a source of drinking water for 49% of households in Ouagadougou, where only 23% of households had private connections. Figure 4 shows the collective water supply arrangements for drinking water at Ouagadougou in 2003. Note the concentration of drinking fountains in outlying urban areas (the blue dots), where the population does not have access to private connections. Figure 4 : Collective modes of water supply in Ouagadougou in 2003. The blue dots show where drinking fountains are located while the green dots show where there are pumps or wells and the orange dots show wells outside of the concession system. Like most African cities, Ouagadougou is characterised by urban sprawl that public services have trouble serving. 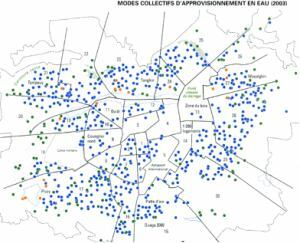 The supply of drinking water to cities with populations of over 10,000 has been entrusted to ONEA, the National Office for Water and Sanitation (Office National de l’eau et de l’assainissement). It is hard to cost the installation and maintenance of a drinking fountain as these vary so much depending on the region. As an example, the investment cost for a private operator installing a drinking fountain is around 450 Euros in Dakar (Senegal) and in Nouakchott (Mauritania). The table below presents the balance sheets for three drinking fountains in Africa. Balance sheets for some drinking fountains in Africa - Source : Water and sanitation program, 2000. 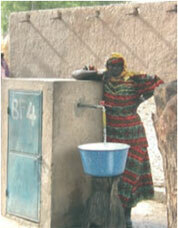 - Water and sanitation program. Rapport sur l’adduction d’eau potable avec pompes à énergie solaire (Report on supplying drinking water using solar powered pumps) including a section covering drinking fountains and detailing the types of taps and meter used for these works. - Prepaid water fountains : Example.